Butternut squash soup would make an elegant first course to a more formal Thanksgiving dinner. I prefer to serve my dinner family style, and I never serve soup at Thanksgiving, but I love butternut squash and I wanted to come up with a way to use it as an introduction to the bigger meal. So I thought using it in a cocktail could be interesting. Recipes for butternut squash soup sometimes call for chipotle peppers (the canned chipotles in adobo) and ginger, which I thought would be interesting in a drink. For the chipotle, I use a few squirts of Tabasco's Chipotle Pepper Sauce, which has a nice smokiness and is not overwhelmingly hot. To get butternut squash flavor in a liquid form, I used the technique from local bartender Todd Thrasher of PX in Alexandria, Va., to make "Butternut Squash Base," the strained liquid from pureed roasted butternut squash. Thrasher uses it in his drink Butter 'Nut' Craig, which sounds good. I roasted a medium-sized butternut squash, which, after pureeing and straining, yielded about a cup of liquid, enough for 6 to 8 drinks. This is nothing like Hot Buttered Rum, but the play on the classic holiday cocktail's name fits this drink perfectly. 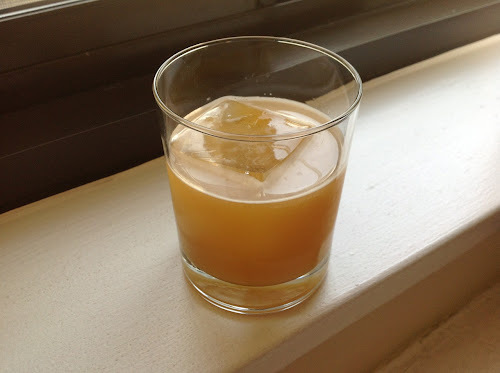 Combine squash base, rum, ginger liqueur and hot sauce in shaker with ice. Shake until cold. Strain into rocks glass with ice. 1. Preheat oven to 400 F. Put cut squash in a 9 X 13 roasting pan, cut side up. Brush with olive oil and sprinkle with 1 tbsp. brown sugar and salt. Roast until the squash is sufficiently softened to be easily pierced by a fork, about 40-60 minutes (roasting time may vary; Thrasher's original recipe called for 30 minutes of roasting, but my squash was still pretty hard after only 30 minutes). Allow to cool slightly, then scoop the squash pulp out and transfer it to a food processor. Add the simple syrup and the remaining tbsp. of brown sugar and process into a puree. Place a strainer lined with cheesecloth over a bowl. Transfer the pureed mixture to the strainer and press through. Discard the remaining solids. This was good. Readers, be warned: It has kick.